Signing off and toasting: To using this Ultimate health blogging checklist to rock your blog (and grow your biz). Originally published January 2018; updated with even more awesomeness September 2018. You’re a health and wellness professional and you have a blog. You know how important good content is to build your “know, like, and trust” factors with your audience and ideal clients. Having great content (be it blog posts, vlogs, or podcast episodes) is the first step to building your authority and following (and sales). Awesome blog content is also a great foundation for your social media and newsletter. But, content is just one-half of the phrase “content marketing” which, as a business with an online presence, is really what you’re going for, right? ‘Cause y’know: content + marketing = traffic = audience = subscribers = customers. So, that’s why I created the Ultimate health blogging checklist! Become a customer or client. Enjoy using this checklist to the fullest potential to rock your health blog and turn it into a content marketing machine! Don’t have time to read it all? Download the overview in the checklist now. How do your readers reach your website? You can check your site’s analytics, but it’s likely that people land on your site through a blog post (which is the entire raison d’être of your blog – to market your business using quality content). Regularly publishing awesome content and promoting your blog posts is what will draw people to your site. Whether that’s from a search engine like Google, or from a social media post. So, for simplicity, let’s say a reader lands on your home page and looks for your blog. How will they find it? Is your blog in your main menu or a footer menu? Either one works, as long as it’s at the top-level and not in a sub-level or drop down option. Is it called “blog?” Make sure it’s easy and intuitive for a new visitor to find. I recommend calling it “blog”. For now, I’m trying mine on my footer because I want my header menu to be very simple, with just About, Free Resources, Work with me, Contact, and a search option. That’s it. Can you see the featured images for each post? Is the blog post title/headline clearly readable? Do you include just a few lines of the introduction so they can easily scan through your different posts? (This is optional, assuming your headlines are great). Do you have a “next” button at the bottom (or do you use infinite scroll)? In my opinion, I dislike the “infinite scroll” when it comes to blogs. I don’t find people’s websites to see everything they’ve ever said in date order, so I prefer seeing the featured images (with the title), just a few lines of the intro, and a “next” button at the bottom. It also doesn’t give you an option for a handy menu at the footer of your blog page – for social media following buttons, or your legal docs either. Do you have categories for different kinds of posts? Can you filter blog posts by category on your main blog page? Do you have a search bar so readers can look for a specific topic or keyword? Do you track which terms are being searched? Having this set up makes for a better user experience (UX), plus it gives you GREAT market research and insight into what people are looking for, and the exact words they use. This can give you ideas for future blog topics, and also the keywords to use in your copy and try to rank for on search engines. Here’s a very comprehensive post full of simple SEO tips – for both your website and your posts. Here’s how to set up Google Analytics in your WordPress site, via my friend Marie, the girl who knows tech. Have you converted your website (and blog) from “http” to “https” yet? Don’t clutter your URL with unnecessary info, like dates, or the word “blog,” etc. Make it super-simple. Format – Are there headers, subheaders, etc.? Do you know about the F-pattern based on eyetracking studies? Images – Do you have a featured image for each post? Do you sprinkle in a few other images too? Are your images findable, clickable, and shareable? Here are 12 types of visual content you can use in your blog. If you need content for your blog posts, you don’t have to create everything yourself from scratch every single time! There are lots of ways to get quality blog content! Readability – Is your post “scannable,” with short paragraphs and grade-school reading level vocabulary, etc.)? One free app I sometimes use is Hemingway app. PRO TIP: Take all electronic recommendations from apps under advisement – don’t just accept what the software says. That goes for all writing apps. Interesting – Do your posts read like a text book or corporate white paper, or a blog post with some personality? Conversational – Do you write to one person in the first person? Quality – How’s your spelling and grammar? The free Chrome plugin I use is Grammarly. Length – Are your posts 500+ words? The highest shared content and highest ranking content on Google are all around 2,000+ words. My #1 ranked post “Struggling to blog? 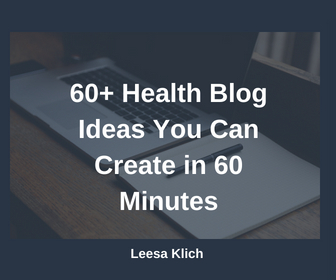 Here are 60+ wellness blog ideas you can create in 60 minutes” is over 2,600 words long. Research – Have you done research for your health post? If you’re making health recommendations, they’re not something you dreamed up – they came from a credible source, right? Here are three reasons to link to the source, and how to research your health topic efficiently. Links – Do you use internal and external links? Internal are within your website, and external are to those references I just mentioned. PRO TIP: Make sure all external links open in a new tab. That way after your readers leave your site, read that other blog’s post & close that tab, your original post is still there waiting for them. Need help with high-quality science-based health content for your blog? I create research-based authority-building “done for you” health articles that are fully customizable. How’s your headline? I’m mentioning this last because it really should be done last, but it is NOT the least important thing…some would argue it’s one of the MOST important parts of your blog post. I’ve curated a bunch of blog post headline resources for you here. If you want a bit of help with creating your health blog posts, I’ve written a few posts on how to write an article for your health blog. The whole purpose of your blog posts are for content marketing. You want to supply amazing content for your audience to show them you’re a reliable, credible expert in your field, and you can help them. To find out more about a product or service you’re offering. All of these are CTAs, and you should have AT LEAST one for every single blog post. Sometimes you don’t even want them to finish reading the whole post before calling them to an action, so you can embed one (or more) into the body of your blog post. What you don’t want is someone to find your blog post, read it, love it, get to the bottom, and then have no idea what’s next! Give them a call to action (CTA)! Once you’ve created an awesome post, please never stop with just one or two promotions of it. Promote it a lot! Share it with your email newsletter subscribers, social media followers, and elsewhere on social media. Derek Halpern of Social Triggers recommends spending 4x more time promoting your content than creating it (80/20 rule). Even, and especially, if your content took a lot of time to create and is amazing! The Content Marketing Institute recommends spending at least the same amount of time promoting it as you did creating it (50/50). I personally use Missinglettr to schedule nine (yes, nine) social media shares throughout the year for every single evergreen blog post I create. PRO TIP: Sharing your blog posts with your followers should be part of your social media strategy, but not all of it! Make sure to also share others’ great posts, and be active in groups with your ideal clients and engage with people who don’t follow you as well! Now that you know what to do for each individual blog post, how about a strategic plan for posts (i.e. which topic/keyword to talk about and which CTA to include each time). How often are you publishing on your blog (at least once/every other week)? As expected, we found that the more blog posts companies published per month, the more traffic they saw on their website. Companies that published 16+ blog posts per month got almost 3.5X more traffic than companies that published between 0 – 4 monthly posts. Here are places to get blog posts if you can’t create all of the content yourself. Feel free to fill in the parentheses and create your own. Fill out the editorial calendar like I show you here. It’s always important to measure success of your plans. It helps you to see what to do more of, what to tweak, and what to stop doing. Let’s be real here, content is a long-term game. My post from July 2017 ranked on page 1 of Google around September, and just got to the #1 position last December. It’s VERY unlikely you will see immediate results (don’t be fooled with promises of “going viral”). Ideally, you’re going to measure the success of your blog posts at least 30+ days after you hit publish. How much traffic (# of hits/visits) did your posts get? Check your Google Analytics or JetPack Site Stats. How many social shares did each post get? Check BuzzSumo (the free version gives you a sneak peek). How has your blog’s overall traffic (# of hits/visits) increased over time? Check your Google Analytics or JetPack Site Stats. Did you put a monumental effort into a few key posts to rank in search engines? How are they doing? Go through this free Ultimate checklist and choose one or two things to implement every week. Download it for future reference if you want. Want my help going through this and prioritizing optimizations on YOUR health blog? Check out my one-on-one VIP Health Blog Optimization Plan service. What do you think? 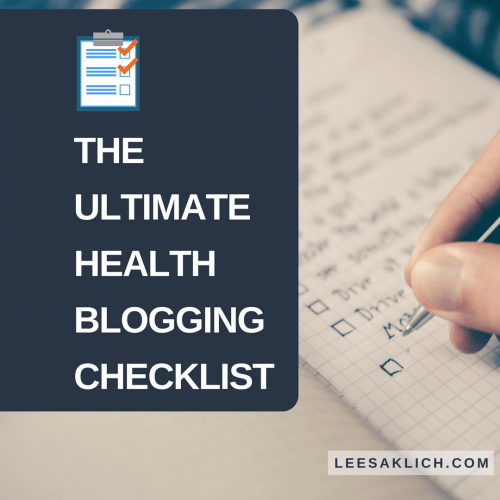 Did I miss any critical items from this Ultimate health blogging checklist? Want me to expand any particular items into an entire blog post?